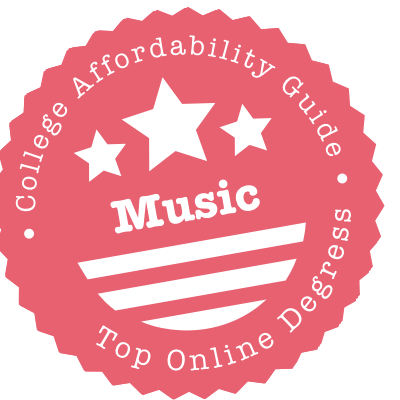 Scroll down to see the top not-for-profit colleges offering music degrees online. Berklee College of Music has a wide range of options for students who want to earn their degree online. Online students earn a Bachelor of Professional Studies, a different degree than students in the on-campus program. Degree options cover topics such as music business, songwriting, and electronic music production. The college also offers more than three dozen online certificate programs at the professional or advanced professional level. Certificate programs range from three to 12 courses and cover everything from individual instruments to music marketing. Berklee Online students have included members of Dave Matthews Band, Sugarland, Nine Inch Nails, and other musicians who fit online classes in around their touring schedule. Music teachers who want to earn a master's degree can complete all their coursework online through Bowling Green State University. The Master of Music Education with a teaching artistry specialization program assigns a teaching mentor to work one-on-one with each student. Students must be working in a teaching position, and their teaching activities will be used as a laboratory to explore the concepts learned during the program. Each student will work with the mentor to develop an individualized plan of study that aligns with their teaching situation. The master's program starts with three classes in the summer, and students take classes in the fall and spring, then complete their degree with another summer of classes. Colorado State University offers a graduate degree in music that can be earned almost entirely online with a requirement for a brief residency on campus. The Master of Music with a specialization in Music Therapy includes classes in music theory, history, and composition as well as coursework in psychology, physiology, and research aspects of music therapy. All candidates are required to attend one four-day session on campus in Fort Collins, Colorado. Students must also complete a practicum in music therapy. Students have the option of a 30-credit plan with a thesis, or a 32-credit plan with a project and written exam. Students can transfer up to six credits, and the program can be completed in about two years. IUPUI has an online Master of Science in Music Technology that is offered through the School of Engineering and Technology. Students learn about computer-based music technology and multimedia design and production techniques that can be applied to video, audio, and graphic production for educational or art materials. Students in this program select a cognate field such as music, education, fine arts, or business, and take 12 credits in the cognate field. They also complete 18 credits in core courses. Applicants must have a bachelor's degree and must show they have an extensive background in music instruction, performance, and literacy. They must also submit an audio/video portfolio of work related to music technology. Liberty University's Department of Music offers several master's programs through Liberty Online. Some can be completed entirely online, and some require short, intensive residencies at the campus in Lynchburg, Virginia. The Master of Arts in Music Education is a 36-credit program that can be completed entirely online. Students may transfer up to six credits. The program focuses on strengthening teaching skills while increasing students' knowledge of music theory and methodology. The Master of Arts in Ethnomusicology requires two one-week intensives on campus. The 45-credit program requires students to complete a thesis and perform a field experience. The Master of Arts in Music and Worship requires up to four intensives, and students must earn between 30 and 45 credits. New Mexico State has a completely online program leading to a Master of Music in Music Education for students who already have an undergraduate degree in music education and are working as a licensed music teacher. Students will gain skills in classroom management, learning techniques and teaching strategies. To earn the degree, students must complete 31 credits, including a written project. Required courses cover research, music theory, music education, music history and literature, and an approved elective. Candidates are required to pass a comprehensive oral exam after turning in their written project. Rutgers University has an online Master of Music in Music Education that allows educators to enhance their skills through a 30-credit curriculum that includes 18 credits in music education and 12 credits covering music history, theory, and ethnomusicology. All students must complete a capstone that requires applied research in music education. To apply, you must have a bachelor's degree in music or music education with a GPA of 3.0 or higher. Applicants must have at least a year of teaching experience and must submit a video of themselves teaching or letters of reference detailing their teaching experience. No performance audition or dissertation is required for this degree program. Sam Houston State University has a Master of Arts in Band Conducting which has about two-thirds of its components available online. Students in the program must attend an intensive three-week summer residency in Ashland, Oregon. Performers, conductors, and composers from around the world work with student band directors enrolled in this program. The 30-credit program is offered in collaboration with the American Band College of Ashland, and classes are only scheduled in the summer. Candidates can complete the program in three summers. Applicants must have a bachelor's degree in music from an accredited college, and they must submit three letters of recommendation. Southeastern Oklahoma State University has a Master of Music Education that combine four semesters of online classwork with one summer term of intensive, face-to-face programming at the campus in Durant, Oklahoma. Students can specialize in instrumental, choral, or elementary music education. The curriculum for this 33-credit program includes courses in music education; music history, theory and literature; performance; and a thesis or project. The content is designed to be practical for working teachers, giving them techniques and ideas they can use immediately in their own classroom. The Baptist College of Florida offers onlne music degrees at all levels from associate to master's. The Master of Arts in Music and Worship Leadership is a practice-oriented program for individuals who plan to work as worship pastors, church musicians, and in similar positions. The 30-credit program places an emphasis on research and requires a comprehensive exam, internship, and combined research/performance project. The Associate of Arts in Music is a 66-credit program that provides students with a foundation to study music. Four-year degrees include Bachelor of Music in Worship Leadership, Bachelor of Music Education, and Bachelor of Arts in Music. All full-time undergraduate music majors must be enrolled in an ensemble every semester. The University of Montana has an online delivery option for the Master of Music with a concentration in music education. This is a hybrid program, with classes offered online during the fall and spring, but students must attend some classes on campus during the summer. Students can select a thesis or non-thesis option. The thesis option is a 30-credit program that requires a thesis recital. The non-thesis option requires students to complete 36 credits in coursework, including up to six credits in courses outside the music department. All students are expected to participate in an ensemble for three semesters. The Master of Arts in Music Education at University of Hawaii at Manoa requires a Bachelor of Education for entry and selects enrollees who are currently teaching. (Students without a BEd must attend on-campus.) Applicants must all pass an entrance exam on music theory, aural skills and music history. Once enrolled, students choose advanced courses from two of three areas: musicology/ethnomusicology, performance, and music theory/composition. Not every class is available online, however. Half of the 30-credit program comes in the form of music and music education electives; a research paper or project rounds out the curriculum. UMA Online's Bachelor of Music (BM) in Contemporary and Popular Music requires an audition to get in. Students without much experience can instead start with the Associate of Science in Music, a two-year degree that will introduce them to basic concepts and let them take instrument lessons. Once they're ready for the BM, they'll get to focus on audio recording, composition, performance or sonic arts. There's also an online ensemble seminar to attract students who want a taste of extracurriculars. UNK's Master of Arts in Education - Music Education is a 36-credit program for people who already hold a bachelor's degree in music. It's also the only distance education program in Nebraska accredited by the National Association of Schools of Music. The music core curriculum blends courses in Music Analysis and Education Research with music history coursework from eras of the student's choosing. Students then learn how to teach music through foundational courses in education and classes in music pedagogy before completing a research and/or performance capstone. Valley City State University is one of just two schools in North Dakota to offer an online music degree. The BA/BS in Music involves core coursework in theory, aural skills, conducting, scoring and arranging, and history and literature. Performance courses are also required, with students spending the most time studying a single instrument, followed by ensemble and piano work. For a capstone, students choose between writing a thesis, composing a piece, or performing a recital. Outside of the BA/BS, the department runs a 12-credit Certificate in Piano Pedagogy and a 15-credit Certificate in Composition. In general, you’re more likely to find master’s degrees and graduate certificates in areas such as music education and music technology than online undergraduate degrees. If you’re lucky, you may come across accredited “hybrid” degrees that combine on-campus performances or recorded performances with online classes. If you’re interested in a BMus, we’d advise you to think carefully about your options. There is nothing that can replace hands-on teaching. An online degree will also limit your exposure to in-person networking opportunities. In the field of performing arts, it’s all about who you know. Avoid schools with low completion rates and high student loan default rates.